The Montage Elite massage chair is the culmination of Omega's efforts to bring you the latest technology with excellent features for a phenomenal massage. The Montage Elite is sophisticated luxury designed to take you to the highest states of relaxation and tranquility. The Montage Elite was designed and developed to bring you a complete therapeutic and sensual massage experience. 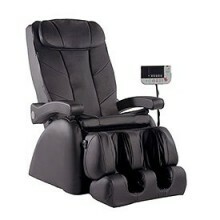 The Montage Elite Massage Chair Recliner has a full back massage with a complementary air massage system for your lower body to provide you a full body massage. The Montage Elite has a heat therapy package in the backrest, seat and footrest. To balance out your sensory experience, the Montage Elite has music therapy that can synchronize the massage to the rhythm of your music. The Montage Elite massage chair provides a full sensory experience. From the moment you sink into this plush massage lounger, you know that the Montage Elite is something very special. The American designed Montage Elite massage chair is luxurious elegance at its finest. The rounded side panels of the Montage Elite and the long armrests bring an attractive touch to any room. The plush backrest is soft, comfortable and velvety to the touch. The armrests are long, wide and comfortable. The armrest ergonomically slides back when you recline the massage chair maintaining your arms in the same position. The Montage Elite massage chair is a strikingly beautiful massage chair loaded with therapeutic massage therapies. Click the button below to add the Omega Montage Elite Massage Chair to your wish list.